I have covered a variety of bird feeders and feedstock in the last several articles. Hopefully, this information helps readers to attract more birds and more species of birds to their yards. There is one more article on the “back burner”, as it were, covering nectar and fruit eating birds, but it will have to wait until spring. In this article, summer resident and transient birds that over-winter will be covered. What gave me the idea to deal with this subject is that I have seen three such species this winter alone, whereas, I have only seen one example before – a pair of Brewers Blackbirds spent the winter at our place on the farm in the early 1960s. 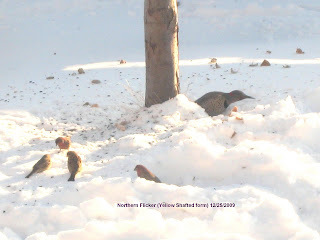 The birds alluded to above are: the Northern Flicker (yellow shafted form). 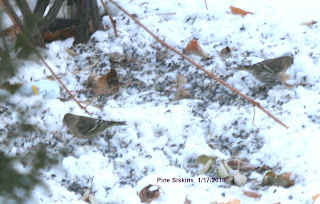 Dark Eyed Junco (slate coloured form) and Pine Siskins. None of these birds are highly migratory, so their being here is not that great a surprise, but a surprise nonetheless. One of the great wonders and mysteries of nature is the annual migration of birds. An even greater mystery is why the odd migratory bird does not migrate – something it is born to do. In most cases these deviants perish before spring arrives. Contrary to the widely held belief that these birds freeze to death, they in fact most often starve to death. Seed eaters, such as juncos and siskins do quite well, but insect eaters almost never survive a Saskatchewan winter, and the ones that do have to change diets and be lucky. From time to time, robins are reported being seen in the winter, but seldom after January. Even though their diet of fruit may have kept them alive well into the winter, but in the end that is not enough. They simply starve. Reports of small flocks of robins in late February and early March are cases of mistaken identity. In these cases what people think are robins are actually Pine Grosbeaks that have moved down from the north. To the casual observer a robin sized bird with lots of red on it seems to be a robin (what else could it be?) and is reported as such. One has to keep in mind that robins that try to over-winter usually come in ones and sometimes in twos, but never in flocks. Finally, no birds return “too” early in the spring only to face starvation. Some insect eaters, such as robins, do return somewhat early only because they can survive several weeks, if necessary, on fruit that has stayed on trees over the winter. Another problem faced by over-wintering birds is dehydration. Most birds (and livestock for that matter) will not eat snow and require water, and therefore, over-wintering birds that do manage to avoid starvation face death from dehydration. This, in fact, is why the efforts of fish and game organizations in releasing pheasants into the wild locally, in the hopes of establishing a permanent population, have largely failed. The winters must be such that temperatures rise above freezing from time to time creating water puddles that birds can drink from. The weather that we have had the last couple of weeks would have done just that, but it cannot be counted on from year to year. This year over-wintering birds would have been in luck – at least for the time being. This week I have included two photos of over-wintering birds. One is of Pine Siskins feeding on the ground in our back yard; the other photo is of a flicker and some House Finches feeding on the ground in our daughter’s yard in Saskatoon on Christmas day when temperatures were in the -30C range. I have not seen flickers nor juncos in our yard, but the siskins are still here, so be on the lookout for them.